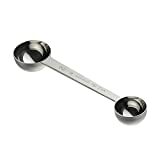 Get the proper measurement every time with this stainless steel Coffee Scoop. Made of stainless steel with a mirror finish. Double sided design and style that measures 1 and two tablespoons. Developed to last with hefty use. A useful utensil in any kitchen.